According to Kantar Worldpanel, for the three-month period ending in January of this year, Google's OS has climbed back to the top of smartphone sales in the United States with a 49.4% market share. Apple had the No 1 spot until recently thanks to strong sales of its new iPhone 5, but Android has been able to make its way back due to competitive carrier discounts. 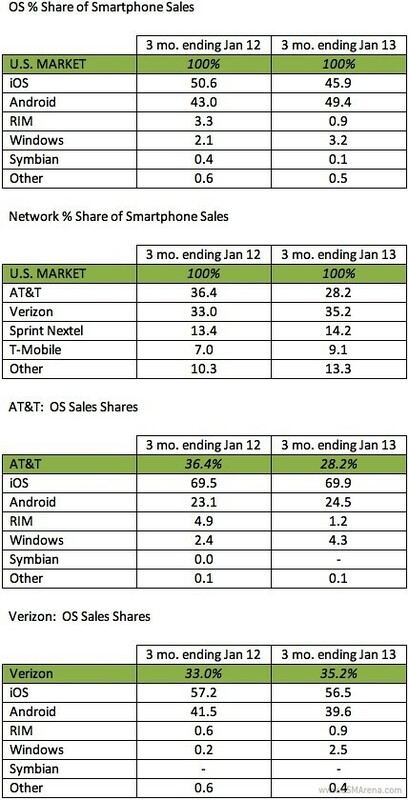 Sprint's cut of the on-contract price of the Galaxy S III to $99 helped spur the strong Android sales, where some 39% of all Sprint devices sold were S III's. Average price-per-OS also plays a factor. In the three month period ending October 2012, both iOS and Android devices saw similar average costs per unit at $130 and $127, respectively. This most recent period, however, saw a significant drop for Android to $95, while iOS went up to $146 per unit. As far as the carrier shootout goes, Verizon has taken over the first spot from AT&T with a 2.2% hike from last year, while T-Mobile and the other smaller networks have seen increasing market share as well. Like this for example: http://www.theregister.co.uk/2012/11/20/open_and­_shut/ ? Have fun reading that. So glad someone realized that. Lol.